The University of Chicago Library invites applications for short-term research fellowships for use during 2012. Any visiting researcher residing more than 100 miles from Chicago, and whose project requires on-site consultation of University of Chicago Library collections, primarily archives, manuscripts or printed materials in the Special Collections Research Center, is eligible. Support for beginning scholars is a priority of the program. Applications in the fields of late nineteenth- or early twentieth-century physics or physical chemistry, or nineteenth-century classical opera, will receive special consideration. Previous University of Chicago Library research fellowships have been awarded for studies in fields including medieval culture, nineteenth-century American politics, law, theology, urban history, modern literature, and African American history. Awards will be made based on an evaluation of the research proposal and the applicant’s ability to complete it successfully. 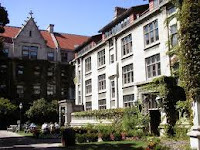 Priority will be given to projects that cannot be conducted without on-site access to the original materials and where University of Chicago collections are central to the research. Up to $3,000 of support will be awarded to help cover projected travel, living and research expenses. Applications from women, minorities, and persons with disabilities are encouraged. The deadline for applications is February 14, 2011. Notice of awards will be made by April 15, 2011, for use between January 1 and December 30, 2012. Demikian kami sampaikan tentang Robert L Platzman Memorial Fellowships, University of Chicago, USA semoga informasi tentang Robert L Platzman Memorial Fellowships, University of Chicago, USA ini bermanfaat.